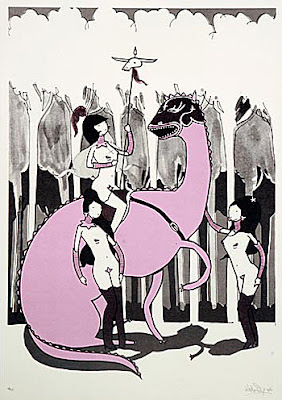 Stella Dore drops some new work on their website including this new screenprint 'Dragon Women' By Kid Acne. 3 colours, hand pulled screen print on 250gsm cream recycled stock paper. Signed and numbered by the artist. They also have a new canvas by D*Face available in his gallery section on the site as well new Eine & I- Lib originals, check them out and get in there quick to avoid disappointment.